Shortly after the British and American governments affirmed U.S Lieutenant General Winfield Scott’s proposal to jointly occupy San Juan Island, the Royal Navy started looking for a home for its British Royal Marine Light Infantry contingent. Roche described the ground as "well-sheltered, has a good supply of water and grass, and is capable of affording maneuvering ground for any number of men that are likely to be required in that locality..." He added that a trail, 11 miles long, led from this area to the Hudson’s Bay farm at Bellevue. American Camp really began on a grassy slope about 200 yards from the shoreline of Griffin Bay. That’s where Capt. George E. Pickett and Company D, 9th Infantry landed on July 27, 1859. 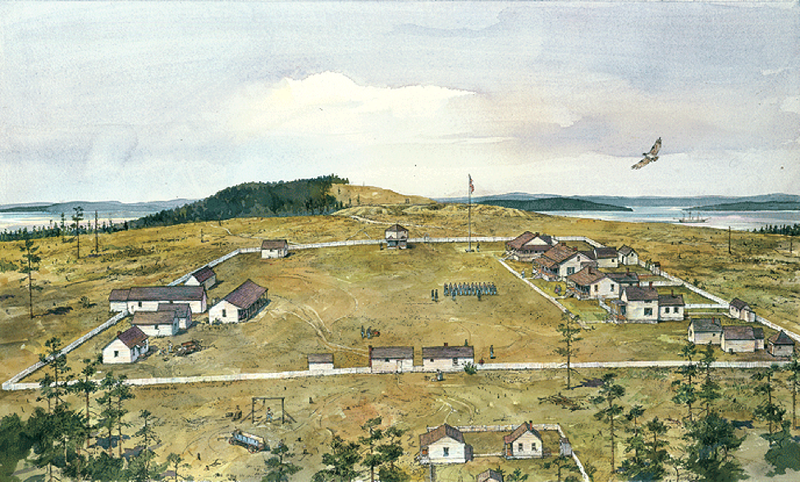 With the first tent stake, Pickett established an American military presence on San Juan Island that lasted 14 years. The location of the encampment provided challenges however. "We are encamped in rather exposed situation with regard to the wind, being at the entrance of the Straits of Fuca," Lt. Col. Silas Casey wrote later that summer. "The weather at times is already quite inclement." Despite the challenges caused by the natural location of the site, the post continued, in part due to the construction of an earth fortification, through July 17, 1874. "(Casey's camp) is very strongly placed in the most commanding position at this end of the island, well sheltered in the rear and one side by the Forest and on the other side by a Commanding eminence," wrote U.S. Captain James Prevost, commander of the H.M.S. Satellite. The post served its purpose until November 1859 when Lt. Gen. Winfield Scott and British Columbia Gov. James Douglas finally agreed to a peaceful joint occupation by a company from each nation until the boundary dispute could be resolved. Eight companies from four regiments - all regular army and under command of 15 different officers - would endure through some of the most tumultuous years of American history. They endured isolation, bad food, worse quarters and crushing boredom. Some soldiers deserted or even committed suicide. But most endured and by so doing contributed to the legacy of peace we celebrate today. Just east of the American Camp visitor center, within easy walking distance, is what at first appears to be a modest hillock, its crest giving on to skyline. However, once there it's instantly apparent that one is standing on the ramparts of a fortification fashioned by human hands. And laid out from the far ditch of the structure to the slopes of Mt. Finlayson is an astounding sweep of open prairie flanked, less than a mile apart, by the Strait of Juan de Fuca and Griffin Bay. This is Robert's Redoubt, the commanding position ordered at the height of the Pig War crisis of 1859 by U.S. Army officials at Vancouver Barracks to establish an American deterrent to the three Britishwarships (with 64 total guns) anchored in the bay. And it served notice that the Americans intended to remain on San Juan Island for as long as it was required to back the United States' claim to the San Juan Archipelago. Today the redoubt is one of the best preserved fortifications of its kind in the nation and continues to stand sentinel of over prairieland and saltwater shore, though instead of warships these days visitors are alert for bald eagles and red fox hunting the grasslands or hopefully will spot orca whales breeching off shore.